An Amtrak passenger train struck a semitrailer carrying kayaks on the tracks near North Maple Road and Huron River Drive in Ann Arbor Township Saturday afternoon. No one was injured in the crash, which occurred about 12:50 p.m., said Washtenaw County Sheriff’s Office spokesman Derrick Jackson. The train struck the semitrailer, splitting it in two, Jackson said. One half lay on the north side of the tracks with kayaks spilled out shortly before 2 p.m. The other half lay on its side on the south side of the tracks. Jackson said the truck driver had been rerouted to Huron River Drive from his original route, After discovering he could not cross the one-lane bridge over the river because the truck was too heavy and too wide, he tried to back up. While he was trying to maneuver the rig back across the tracks with the help of another man, the train began approaching and the crossing gate came down. 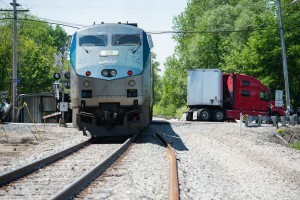 The trailer was still on the tracks when the westbound Amtrak train came through the crossing. The driver was able to get out of the truck cab before the crash occurred. Another passenger, Gabrielle Dickson, who also boarded the train in Dearborn, said she heard and felt the crash and then saw the split open trailer and the spilled kayaks. Passengers were told no one was injured, she said. John Biancke lives near the railroad tracks. He and his wife were working outside when they heard the commotion. An Amtrak spokeswoman said the train was the Wolverine 353, which runs between Pontiac and Chicago. It was carrying 253 people, including passengers and crew, Vernae Graham said. The train, which had two locomotives and about six passenger cars, was still blocking the railroad crossing at North Maple Road about 2:30 p.m. Passengers were still on the train. As of about 4:15 p.m., the train had been cleared to continue on its route, but officials were waiting for the completion of a track inspection before proceeding, Graham said. The westbound Wolverine runs daily between Pontiac and Chicago three times a day. The 353’s scheduled departure from Pontiac was 10:35 a.m. It was to have departed Ann Arbor at 12:17 p.m. and arrive in Chicago at 3:38 p.m.
An eastbound Amtrak train was also been delayed by the accident. The Wolverine 350, which runs between Chicago and Pontiac, and had been scheduled to arrive in Ann Arbor at 1:05 p.m., was waiting on a siding near Chelsea, Graham said at 4:15 p.m. About 3:15 p.m., Jackson said the train was stopped somewhere near Chelsea waiting for the track in Ann Arbor Township to be cleared.